The popularity of horror films set in polar settings is hard to ignore. In the 1950s, during one of horror's most misunderstood subgenres - the creature feature film - polar landscapes were a common setting that harbored dinosaurs, aliens, and mutant insects. However, those landscapes assumed roles subordinate to their narratives' focus because more pressing geopolitical issues related to the Cold War dominated the day. Nevertheless, a perfect storm of ecological traumas such as global warming has recently inspired an avalanche of polar horror films featuring more dynamic environmental themes and eclectic ecological crusaders. Instead of focusing on Red Scare geopolitics, these narratives examine polar landscapes' unique climate and geography and their fragile environmental and ecological conditions. Also, politically sophisticated, holographic characters motivated by economic, ecological, political, and spiritual concerns have replaced the predictable stock characters popular in 1950s creature feature films. At least a dozen polar horror films have been released since 2003, and among the best is The Last Winter. Directed by Larry Fessenden, The Last Winter begins after a "historic vote" in Congress occurs, allowing oil companies to drill in Alaska's Arctic National Wildlife Refuge. One company, North, wastes no time in procuring permits. The film pits a crew of North's drillers led by Ed Pollack (played by Ron Perlman) against a group of "greenies" led by James Hoffman (James LeGros). The environmentalists make sure North conducts its drilling operations in ecologically friendly ways. However, Hoffman and his team, after collecting notebooks of data in outposts surrounding the Kit well, discover an atmospheric disturbance that causes characters to act strangely. Hoffman believes the permafrost is melting, causing chemicals and other unwanted visitors to seep into the atmosphere. Pollack wants nothing to do with this "global warming bulls**t," and the two ram heads until finally it becomes clear something spooky is haunting the compound. With its opening scene, The Last Winter shifts the focus of polar horror films from monstrous invaders to monstrous corporations. When a North employee views a public relations video that celebrates Alaska's exotic qualities, we realize how distorted North's view of the Refuge is. The video is pure propaganda justifying the company's presence in the "untapped" Refuge. Narrated only through North's point of view, Alaska is described as a "land of great natural beauty and diversity," suggesting oil tycoons should disrupt its biodiversity because its bounty is beyond plentiful. Alaska possesses "black gold," a reference to oil's corporate appeal, not its consumer appeal. And the video's triumphant music suggests that conquering the Great White North is a sign of civilized progress. However, the video's point of view ignores environmental studies conducted in the Refuge and reminds viewers how geopolitical conflicts between nations have changed. Political organizations representing ideologies such as Communism are no longer waging philosophical wars. Instead, conflicts between political constituencies such as environmentalists and corporations are waging battles for political capital. Geopolitics in the new millennium is embedded in the Earth itself. What's in the land is more important than the land itself. Arctic landscapes and weather serve an important role in this ecological narrative. After the opening credits, a montage of landscape shots depicting the barren tundra, sun, and white landscape is offered. The first two include a "hot" or "orange" sun, but the next four don't, suggesting a symbolic darkening and ominous foreshadowing. The fourth depicts a piece of wood, and the fifth a set of caribou antlers. They reveal how wood and bone are part of the Arctic's natural biomass and that bone and plant matter eventually become fossilized and ultimately oil. Throughout, strange, unpredictable weather patterns characterize the Refuge's climate and jeopardize the team's existence. We see footage of the aurora borealis, a reminder of the Arctic's atmospheric complexity. The team's cook, an Arctic native, says the weird weather patterns are "like a friend speaking strangely," and the weather is getting more unpredictable annually. A subjective camera shot offers the snow's point of view, characterizing flakes as a roving spirit. Hypothermia also threatens characters' survival. When a representative from North visits, he calls the region "ugly as sin out here" and "pure white nothingness," "the last place on Earth". Geography and climate are as menacing as any monster. Animals also serve an important purpose because they are symbolic harbingers of impending doom that only the ecologically sensitive understand. While reading data in his outpost, Hoffman notices an aggressive crow penetrate his tent. To Hoffman the crow's aggressive behavior means the "sour gas" (fumes released from the permafrost) may have affected the crow too. The bird's aggression reminds Hoffman of nature's wrath. However, the spirit of caribou is what terrorizes the team. When Hoffman leaves his outpost after a bizarre wind gust, hundreds of caribou footprints surround the tent. The "greenies" often notice ghostly visitations from herding caribou-like apparitions. During a trek to a nearby fort, Hoffman sees enormous caribou spirits, which at one point are considered the mysterious Wendigo, but Pollack cannot see them, implying that only the ecologically-sensitive can "see" environmental anomalies, and that only they are capable of altering Earth's future. As the movie progresses, it's clear that each man's fate is linked to his willingness to promote ecological sustainability. And Hoffman's assistant, Maxwell (Zach Gilford), utters the film's most important ecological statement. He understands the essence of oil and how mankind's incessant hunt for it will doom society. He states, "We shouldn't be here. We're grave robbers. It's coming out from the ground. Ghosts. What is oil any way but fossils, plants, and animals from whatever millions of years ago?" For Maxwell, extracting oil from the Earth is the equivalent of exhuming animal corpses. Hoffman represents environmental science, and his ideological perspective is persuasive, assuming an almost crusading, evangelical appeal. Hoffman is an "oil geek"; he's witnessed every major oil-related global catastrophe, from Iraq's burning of Kuwaiti oil fields to the Valdez oil spill. Ecological disasters define his character. His presence in the Refuge is prompted by his desire to observe the planet's last "pristine, untouched" wilderness. In contrast, Pollack's presence in the Refuge is prompted entirely by capitalism and profit. One joust occurs when Hoffman reminds Pollack that he and his team "don't work for North"; instead, they "work for the American people" and will "make sure that North keeps its end of the bargain". Pollack offers a radically different assessment: the American people want "energy independence," but Hoffman replies that "inflating their tires and caulking their windows" will provide the same amount of oil Americans will receive from Refuge drilling. Verbal boxing matches such as this one occur throughout the film. Pollack is Hoffman's double, and his dictatorial demeanor contrasts perfectly with Hoffman's democratic tendencies. Although North is working "in concert" with environmentalists, their relationship is a sham: Hoffman's assistants wear North jackets, and his notes, once labeled as "property of James Hoffman," are re-titled "property of North Industries". When Pollack tells Hoffman he needs his approval, Pollack says, "I'm not gonna try to handle this with some diplomatic mumbo-jumbo. I'm just going to tell what I need, and I'm gonna expect you to deliver." However, Hoffman stands firm: "I'm not going to sign something just because you need me to." Pollack calls Hoffman and his team "green flags," conveying the connotation of "red flags" or warnings. To Pollack, Hoffman is a threat, so he monitors Hoffman and his team and believes their presence is a farce: "North thinks they can win a PR campaign by hiring 'greenies' to do the impact statements; it's a waste of money." When Hoffman explains to him that the permafrost is thawing, Pollack says, "What is this some global warming bulls**t? I mean, don't you think it's a little late in the day to be having that particular debate?" The tension between the two men is palpable. Furthermore, Pollack's dictatorial style is buoyed by a populist, capitalist strain. He reminds Hoffman "The public is with us on this." His attitude represents the entrepreneurial spirit of North as represented by their corporate slogan: "Trust, risk, and results". "Empathy with the land. Is this learned in childhood? The land has changed. The biosphere turned, become unfamiliar and erratic. I would say vengeful, but nature is indifferent to us. We fight for our survival, not nature's. There's a fierceness in the wind I've never felt before. Something is being unleashed in the softening permafrost. Why do we despise the world that gave us life? Why so alienated? Why wouldn't the wilderness fight us like any organism would fend off a virus? The world we grew up in is changed forever. There is no way home. Is there something beyond science that is happening out here? What if the very thing we were here to pull out of the ground were to rise willingly and confront us? What would that look like? This is the last winter. Total collapse. Hope dies." The Last Winter, like many great horror movies, builds upon existing conventions within its genre - the creature feature film - but injects into its narrative contemporary anxieties and tensions that should force horror fans to re-evaluate that genre's template, meaning, and aesthetic value. With a potent dose of realism - the film's themes and dialogue echo reports on the evening news - The Last Winter is one of those unique horror films that makes the genre so hauntingly relevant. 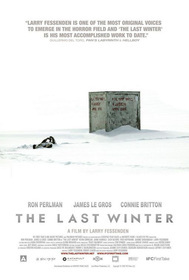 After watching The Last Winter, viewers will not only gain a newfound respect for classic 1950s creature feature films, and particularly those set in polar regions, but they'll also gain important insights into some of global society's most daunting challenges: namely, global warming, climate change, and human ecology. NOTE: This review was adapted from a longer chapter to be published by Routledge in an anthology tentatively titled Eco-Trauma and edited by Neil Narine from Simon Fraser University in British Columbia, Canada. Submitted by Rod Bice (not verified) on Thu, 2012-08-02 08:55. Submitted by Veritas (not verified) on Sat, 2015-06-13 23:24. I'd trust this movie's message about as much as I'd kiss a honey badger. Unknown and deservedly so.